OK, morning are dark until the sun comes up. And there is nothing foreboding or ominous about dark mornings to a fisherman. I didn’t mean it that way. Unless tripping on a tree root in your waders sounds ominous. Dark mornings are for when you just can’t wait to go fishing so you answer to an alarm clock, negotiate through the black cityscape toward the highway, push it up to the speed limit and maybe, if you are running late, the horizon starts to glow. This on a day off from work where you really would have appreciated some sleep. The stream looks great in the dark, like a long black pool. You have to slide into the water from the bank so you sit down, push off, and hope your feet hit bottom. In the dark there’s no telling if the stream is high or if the spot you’ve chosen is deep. A little adrenaline rush. Suddenly you are where you want to be. Let the games begin. What lure to latch onto the cross-lock snap? Move out to the center of the stream or stay put and work the far bank? Is that a branch just below the surface and how do I work the lure close but avoid a snag? Your focus is sharp. Trout are active in the dark, feeding in relative safety. If you have a camouflage jacket all the better because you want to be invisible. You move slow, picking your casts, dropping the lure in the best spots. When trout can’t see you they may strike your lure a second before it reaches the rod tip. An explosion that stops you heart. Sometimes you see a fish follow the lure. Sometimes you feel a tug or jerk and see nothing: A fish hit, but the hook didn’t take. So you rest the fish. Good rule: count to a hundred and cast to the same spot. You only make it to fifty. You cast. If the fish did not feel the hook he will try again, usually more aggressive. If the second cast did not work you cast to a wider area, he is in there somewhere. You move upstream, wading slow, being quiet. You hear trickling water where run off enters the stream off a steep bank. 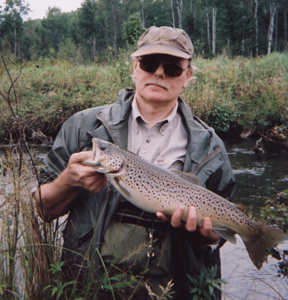 You place a cast to that spot because you once caught a nice brook trout there. No one home today. You move on. Every sweeping bend, every stump, even the deep channel in the middle of a straight has a possible decent trout. 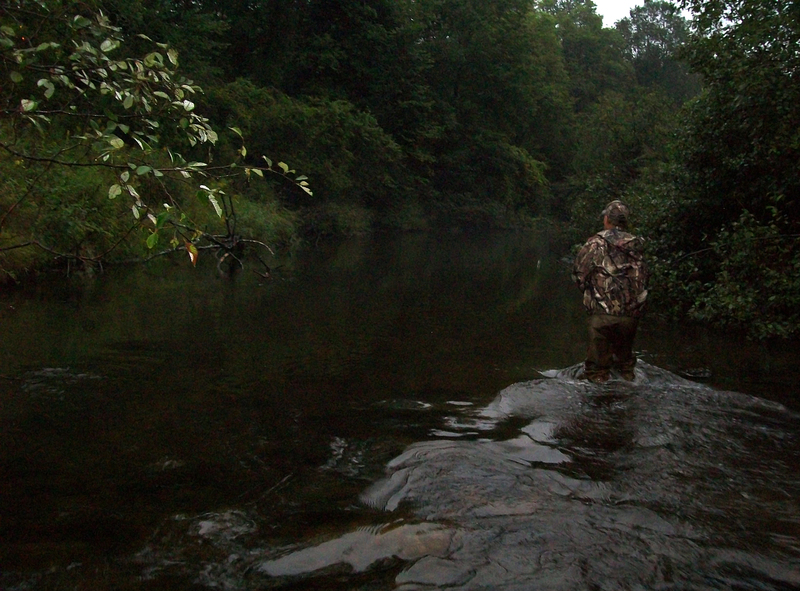 When it is dark the odds rise in favor of a trout that is eighteen inches or better. By the time you feel morning warmth from the rising sun you have a couple trout for dinner. And a photo of the big one you let go.